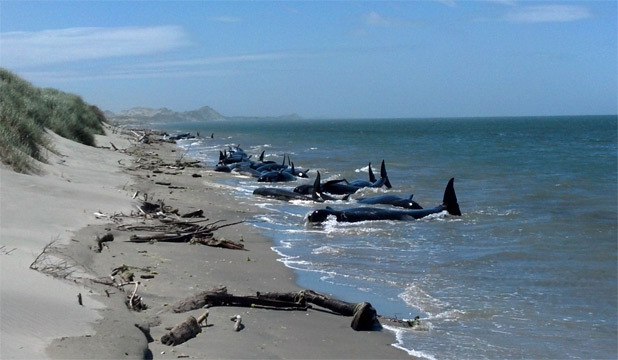 WHY WHALES STRAND: Why Did Pilot Whales Beach at Golden Bay, New Zealand on 15 Nov. 2012? Why Did Pilot Whales Beach at Golden Bay, New Zealand on 15 Nov. 2012? Notice all the flotsam washed in with the whales in the above beachings. 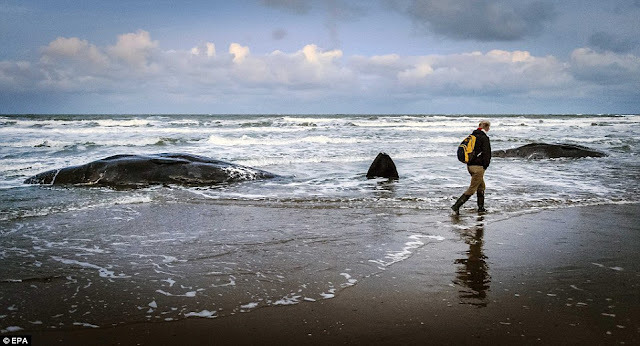 This is evidence that the whales were not navigating when they went ashore. They were washed into the beach by the flow of the incoming surface currents. The epicenter of the quake was located in the lower left hand corner of the chart. The surface currents were washing due east at first. The whales would have been shifted northern side of this flow by the Coriolis affect. The surface currents then swung to the north. The non-navigating pod were carried north and around the southern tip South Island and then north along the western shore to the northern tip of South Island where they were finally washed into the the sand by a strong shoreward flow. These whales were at sea for 27 days without food and water; they were dehydrated, exhausted, and near death when they went ashore. They could not have survived. The rangers did right thing to put them to sleep.